Are you spring cleaning? Is there a growing pile of items you don’t need anymore? Consider donating them to the PHCA Yard Sale. 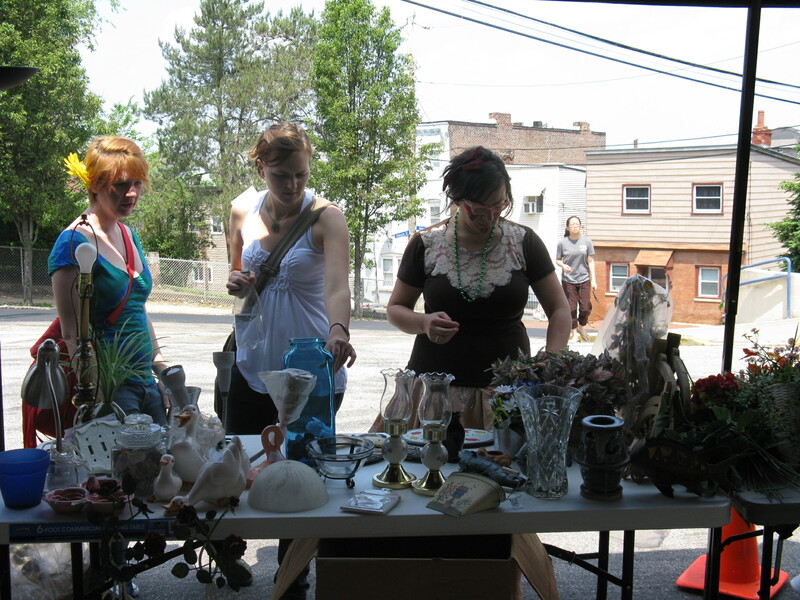 The twice-yearly yard sale helps fund the Polish Hill Arts Festival. The next yard sale will be on Saturday, June 1. We’re looking for books, toys, games, kitchen and household items, tools, antiques and interesting old stuff, jewelry, small appliances (if they work), small furniture items, lamps, and more. We are not able to accept clothing and shoes, Christmas or holiday decorations, upholstered furniture, tv’s, broken or very dirty items. Call us at 412.681.1950 if there’s stuff you aren’t sure about. Donations will be accepted at the PHCA office anytime after Tuesday, May 28. Please consider donating to the PHCA today! Today, October 3, donations made to the PHCA through Pittsburgh Gives will be increased with a percentage of matching funds. Here’s a link to our organization page for this event. – Only credit card donations received through www.pittsburghgives.org during the 24 hours of October 3, 2012 will be matched for this event. No donations via check, cash or stock will be accepted. – Only MasterCard and Visa donations will be accepted and matched for this event. Discover and AMEX donations will not be accepted or matched. – The minimum gift per organization is $25. The maximum gift that an individual can give per organization that will be matched is $10,000. Your gift to the PHCA will help us to continue to work towards making Polish Hill a better place, and to realizing the community plan goals, which were determined by feedback from residents. There is so much to accomplish, and we look forward to the work ahead. We hope that you will support us today. On October 3, 2012, donations made through Pittsburgh Gives can be designated for your favorite local nonprofit — and your donation will be increased with a percentage of matching funds. Many local organizations, including the PHCA (hint, hint), are eligible for matching funds. — Only credit card donations received through www.pittsburghgives.org during the 24 hours of October 3, 2012 will be matched for this event. No donations via check, cash or stock will be accepted. — Only MasterCard and Visa donations will be accepted and matched for this event. Discover and AMEX donations will not be accepted or matched. — Each gift is 100% tax deductible. The credit card charge will display as a donation to ”The Pittsburgh Foundation” on the donor’s credit card statement. — The minimum gift per organization is $25. The maximum gift that an individual can give per organization that will be matched is $10,000. Check here to see which organizations are eligible. Here is more information about the Day of Giving. Please consider donating on this day — to the us, or to another worthy cause. 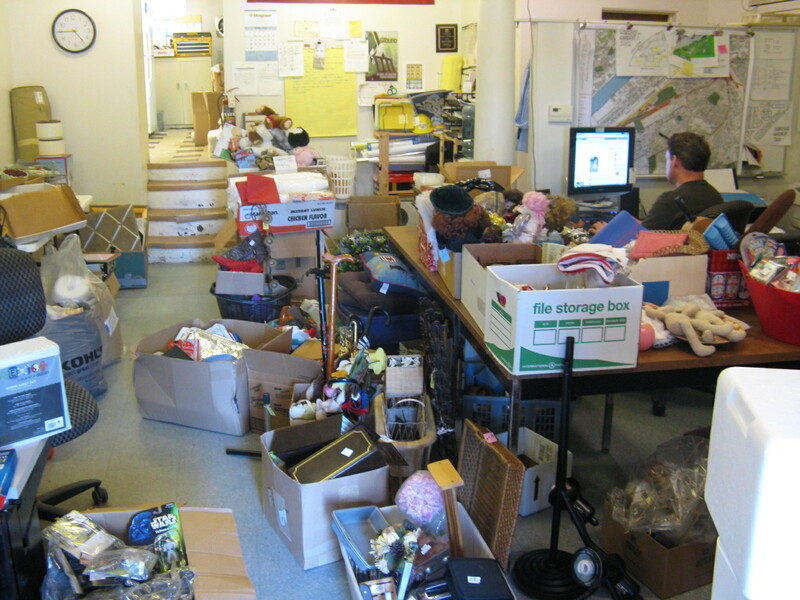 Here’s what the PHCA office looked like just before the last yard sale, in early May — crowded with donations! We are hoping to see something similar next week and are putting out the call. The yard sale helps raise money for the arts festival and has also become a popular community event. The fall yard sale will be held on Saturday, September 15 from 11:00 a.m. to 6:00 p.m. We’re currently seeking donations of household items, books, records, cd’s and dvd’s, toys, antique and retro items, furniture (in good condition), lamps, and more. Items must be clean and not broken; tools and appliances much be in working condition. We are not able to accept clothing, very large or upholstered furniture, or items that are very dusty or dirty. Donations may be dropped off at the PHCA between 10 am and 6 pm on September 12, 13, and 14. If you have items to donate but can’t make it over here during those days, get in touch and we’ll figure something out. And if you have any questions, email us, or call 412.681.1950. Darvina Emmerich contacted the PHCA to tell us about her foundation, Wrapped in Love. The foundation was formed in memory of Darvina’s husband James Emmerich, a former Polish Hill resident. 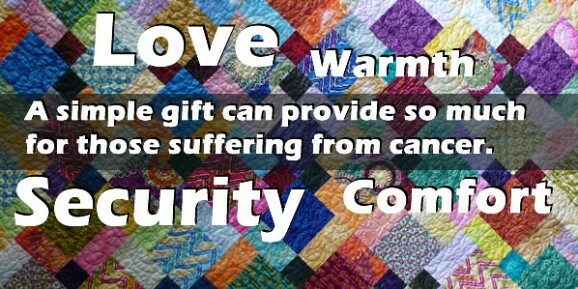 To find out more about Wrapped in Love, or to volunteer to make a blanket, you can write to Wrapped in Love, P.O. Box 13486, Pittsburgh,, Pa. 15243; or call 412-983-7274. We’re slowly collecting another fabulous bunch of Stuff for the next PHCA fundraising yard sale, on Saturday, May 5. We’re looking for books, toys, household items, dishes, furniture (excluding upholstered items), jewelry, tools, and more. We always hope to get a lot of unusual things — that makes for a more interesting sale! Just about the only stuff we don’t accept are clothes and shoes and anything damaged or dirty. 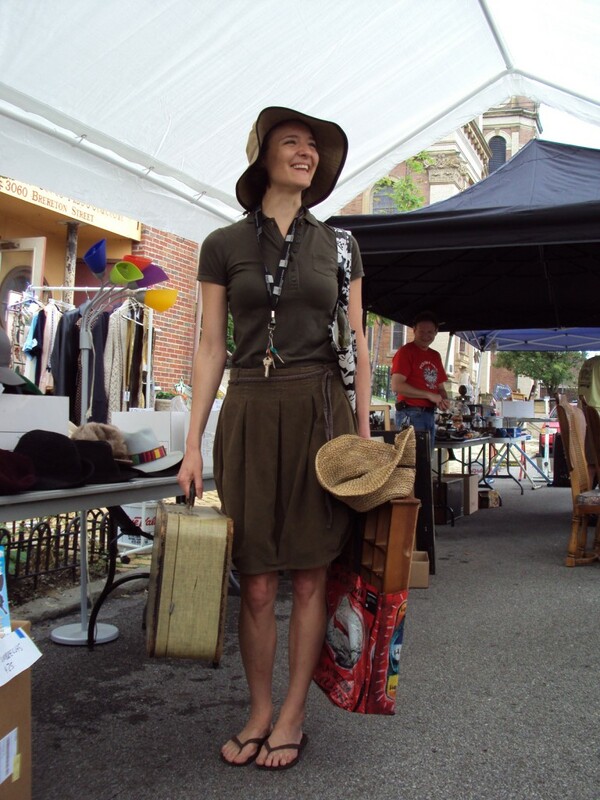 The proceeds from the yard sale go towards the Polish Hill Arts Festival, now in it’s fifth year. Saturday May 5 isn’t just the day of the yard sale — it’s also the May Day Parade, which starts on Gold Way at 12:00 and will proceed up Melwood, to Dobson, then down Brereton, to West Penn Park. After the parade, there will be music in the park, then a picnic and a ball game. We hope you will choose to be a part of both these events — join (or just watch) the parade, then stop by the PHCA and pick up something fun.